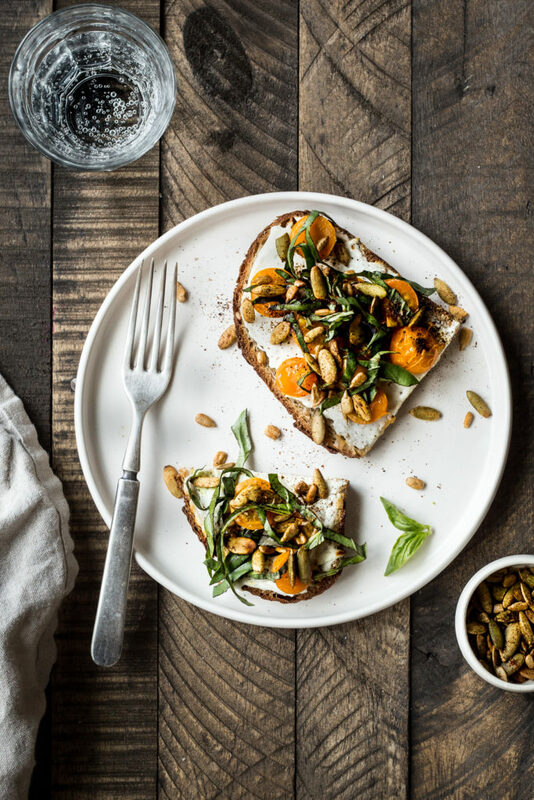 Sun Gold tomato toast with smokey seed clusters is about as fresh and delicious as summer time lunches get around here! Sun Gold tomatoes just so happen to be my favorite and I’m so happy we are finally enjoying an abundance of them. We are about one month later with our tomato harvest this year than we were last season (due to much cooler nights). However, after weeks of hope and a lot of anticipation we were finally able to harvest enough tomatoes to give to all of our CSA members. It’s hard to be patient with certain crops like tomatoes, eggplants, peppers, melons and squash because the fruit can come on slowly at first before totally taking off. Our goal with our CSA is to make sure all of our families receive the same contents in each of their boxes so it can be challenging when we don’t have quite enough for everyone–we’re lucky that we have plenty of other outlets but our CSA is the heart and soul of our business and we hate when they are the last ones to receive some of the season’s best treasures. Thankfully, this week we can all enjoy biting into the first tomatoes and this simple toast is pretty darn perfect. I hope you all enjoy it as much as we do. Slice some of the Sun Golds in half and keep other whole. Heat the olive oil in a small saucepan over medium high heat. Add the tomatoes and cook, stirring occasionally, until they become soft and some burst open. About 3-5 minutes. Remove from the heat and set aside. While the tomatoes cook toast your bread. Hi! I love your site so much! I’m planning to try this recipes but the link to the smokey seed clusters is not working and I wasn’t able to find the recipe by searching on your site. Is that something that can be fixed or the ingredients posted? Thanks! Its’ fixed! Thanks for the heads up!